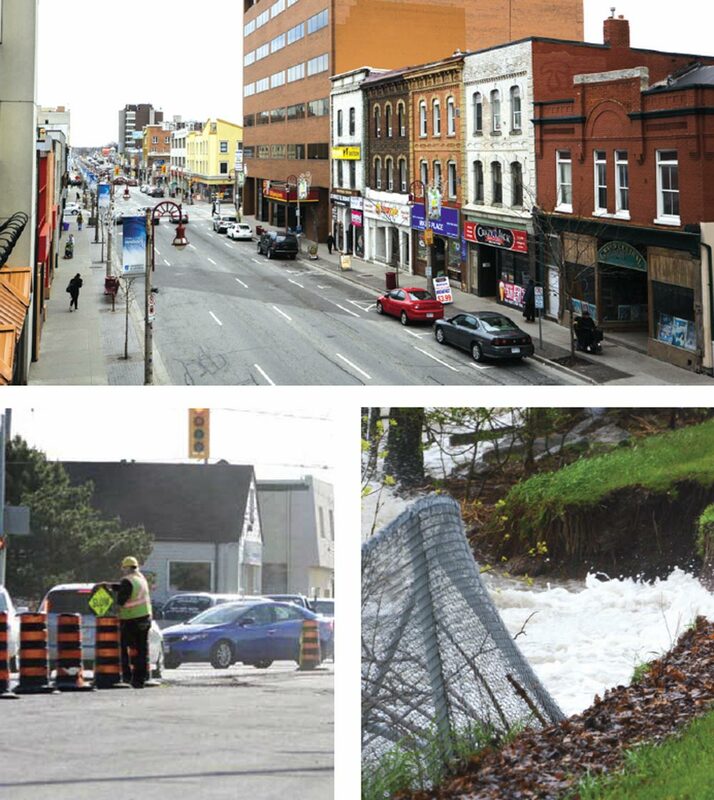 It’s going to be another busy year for Oshawa and residents will quickly begin to notice changes in the downtown core, construction and improvements along the city streets, and development at the city’s waterfront. The coming year is proving to be a busy one for the City of Oshawa as city departments have come forward with ambitious plans for what needs to be done in 2018. During a special meeting of council on Dec. 15, councillors not only got their first glimpse of proposed financials for the coming year, but they got a look at what those dollars are going to be used for. The presentation of the city’s operating budget includes the budgets for all of the municipality’s main departments, along with their proposed work plans for the coming year. The operating budget follows on the complimentary capital budget, a list of nearly $23 million of items to be purchased over the coming year, which was delivered on Dec. 11. What follows is a brief summary breakdown of each of the city’s main departments including the departments role, any notable background information, along with what they have proposed for the coming year, and how much it is set to cost. About: The city’s corporate services department is responsible for the backbone infrastructure of the corporation of the City of Oshawa itself, essentially its inner workings and policies. The department is divided into five branches including: corporate communications, city clerk services, facilities management services, information technology services, and municipal law enforcement and licensing services (MLELS). Background: Debatably one of the city’s busiest departments, it has seen a number of controversial issues come to the table over the last year, including the implementation of council approved regulations for designated driving services, and the beginnings of how to deal with the influx of ride-sharing apps like Uber and Lyft. Most recently, the most highly publicized branch in the department, MLELS, undertook a pilot project to proactively inspect a trio of apartment buildings in priority neighbourhoods across the city. The project was met with praise and received relative success at identifying and solving issues at these buildings. With that said, each year the department struggles with workload, with council’s corporate services committee continuously told by commissioner Bev Hendry that any new project will cause other items to be delayed. This perhaps came to a head earlier this year when pet advocates came to committee to question why it’s taken so long to implement a ban on the sale of cats and dogs in pet stores, something that had been on the books for years. The message was again shared when a letter from a resident was received regarding creating regulations around temporary, short-term rentals like Airbnb. The coming year will once again keep the department busy, especially when it comes to the fall as they will be responsible for implementing and carrying out the 2018 municipal election. The election will not only be the first using Oshawa’s newly approved five-ward system, but will also include the changes made at the Region of Durham that will see two less councillors with seats at the regional table. Along with that, corporate services will once again be turning their attention to transportation as they seek to deal with the issue of regulating ride-sharing companies, as well as looking for ways to modify the taxi cab bylaw in order to level the playing field for them in the tough competition with these apps. The department will also be looking to procure the services of an integrity commissioner to enforce council’s approved Code of Conduct, something now required under Bill 68. Preliminary work will be done on a number of other items including investigating a strategy for relocating MLELS staff once the lease at 44 Simcoe Street expires in 2020, they will be handling any changes at the municipal level once cannabis becomes legal in July and will also be investigating the possibility of using licensing plate recognition for MLELS staff. The department will also be looking to purchase a new PA system for city hall ($250,000), and several IT upgrades including: security technology ($190,000), class system ($190,000), fire dispatch system ($20,000), PeopleSoft upgrade ($250,000), and telephone system upgrades ($45,000). About: The name really says it all for the community services department. This is arguably the department citizens of Oshawa will have the most direct interaction with as it is responsible for waste management, parks operations, road work and winter maintenance, along with fire services. The department is divided in four main branches including: strategic business services, fire services, operations, and recreation and culture services. Background: Over the last year, the city’s community services department most notably completed a costly LED lighting upgrade to Oshawa’s street lights, which cost the city approximately $10 million before certain rebates. As well, the department was in deep this past spring when Lake Ontario surged to levels never before seen causing extensive damage to Lakeview Park and the Oshawa pier. The beach and the pier were closed for some time due to the dangers of the high water and the true extent and cost of the damage remains unknown. However, a report pegged the potential costs at around $225,000 to fix damage to the pier’s foundation. For 2018: Far and away the biggest departmental budget within the city, this year community services is proposing a total budget of $68.9 million, an increase of $2.7 million, or 4.2 per cent over 2017. With a large staffing contingent, $400,000 of this increase is directly related to the increases coming into effect in January as a result of Bill 148. The department is also seeing inflationary increases, along with the need for new equipment and growth related pressures. This year’s business plan sees a lot of planning for the future as the department looks to create a Public Art Masterplan for the city’s current and future public art installations, along with not only completing the business plan for a future fire training facility (currently $1.5 million is slotted in the 2019 capital budget for the facility), but the department will also be looking to revise and streamline emergency response protocols. Community services will also be looking to implement the newly approved Trap Neuter Return Manage program approved by council to deal with feral cats. In terms of consultant services, the department will be looking for external help in analyzing bike routes around city hall ($175,000) and Durham College/UOIT ($195,00), and a new study will be developed to better manage Oshawa’s Second Marsh in the future ($175,000). In a practical sense, citizens will notice the downtown changing as the community services department looks to replace the bike racks, benches, waste bins, and other fixture in the downtown core ($217,000) and they will be looking to purchase the lighting system for a new sports field in Oshawa’s south end as part of a deal with the Durham Catholic District School Board at Sir John Pereyma ($250,000) and redeveloping the nearby Conant Park ($300,000). As well, $90,000 worth of repairs will be undertaken at the waterfront to deal with the damages cause by the severe water levels this spring. About: This is the city department responsible for handling everything growth related in the City of Oshawa. When it comes to approvals, permits and applications, this is one of the first stops for developers in the city. The department is divided into five main branches, including: administration and accessibility, economic development, building permits and inspections, engineering, and planning. Background: To say that recent years have been busy for this department would be an understatement. A development boom in the city’s north end as seen construction values, residential values and building permit numbers go through the roof. In fact, after new records were set in 2015 for all three of these, the city surpassed each of them in 2017 with over $581 million in construction value, nearly $460 million in residential value, and over 2,100 building permits issued as of the end of November. With development aside the department has also dealt with a number of lingering issues over the last year, including assisting with the development of Oshawa’s Harbour Lands, mitigating the impacts of contamination at the Durham Courthouse in downtown Oshawa, along with attempting to finally see the Genosha Hotel restoration project through to fruition. For 2018: The department is looking at a budget of $6.3 million, which is an increase of $202,300 over 2017, mostly attributed to wages. However, this number has been partially lessened by the elimination of a position and the increase in building permit revenues. Put generally, development services organizes its business plans according to the city’s major planning documents, those being Plan 20Twenty for the downtown, the Transportation Master Plan and the associated Active Transportation Master Plan, along with the Airport Business Plan and aims to carry out the objectives within those plans. In terms of roadwork, culverts will be replaced on Mayfair Avenue ($62,000), and Coates Road ($377,0000) and approximately $333,000 will be put into preemptive design work for the future widening of Conlin Road. A pair of road reconstruction projects between Gliddon Avenue and Eulalie Avenue will also move ahead in 2018, including that of Verdun Road ($888,000) and Oshawa Boulevard South ($885,000). However, the big ticket item for the department will be the $5.8 million bridge set to be installed to extend Britannia Avenue East over the Oshawa Creek in order to facilitate development in the Kedron Part II planning area. This area, one of the city’s largest collective builds, will also see progress throughout the coming year. About: The main connection between councillors and staff of the City of Oshawa, the Office of the City Manager is responsible for the overall corporate management of the organization. The office is lead by city manager Jag Sharma, who was appointed to the position in late 2015. His department is divided into four main branches, including, human resources, legal, finance services and strategic initiatives. Background: In recent years, the city manger’s department has been behind some of the more influential reports to hit the council floor including the eventually approved financial strategy, and the asset management plan approved in 2016. These items, which are closely intertwined, will become crucial in the years to come as the city attempts to grapple with a growing infrastructure deficit. It’s a term that has been mentioned a lot during budget time in recent years and refers to the number of infrastructure projects in the years ahead that will need funding, but yet to have a source identified. This year, the number was pegged at around $448 million. In the years ahead, council will need clear direction from the city manager’s office and more specifically, the finance department in order to successfully deal with the issue without pushing the city further into dept. For 2018: In the coming year, the office of the city manager is looking at a total budget of $8.1 million, an increase of $314,800 or 4.1 per cent over 2017. Similar to other departments, the increases are a result of contractual wage increases. However, the office has taken on a new initiative with Oshawa as a “teaching city”, which has resulted in a number of community partnerships for the coming year. For the most part, the city’s finance department, which falls under the purview of the city manager’s office will have its hands full attempting to find ways to mitigate the growing infrastructure deficit and ensuring there are suitable funds to pay for the much needed capital dollars in the years to come. One of the ways in which the city attempts to find money within its current processes is by using an external auditor to analyze city processes and functions to determine their efficiency. These audits are completed by KPMG, and there are six planned for the coming year, including three follow-ups to previous audits in fleet management, health and safety, and real estate, along with new audits in absence management, workforce productivity data and information and enforcement processes. The city manager is responsible for reporting the results of these audits to council.